On Thursday 25 April, join us as at the Mail Exchange Hotel as we honor our ANZAC heroes – and all their sacrifices. We all know the story of our ANZAC’s and the significance of what they did for us. This year, and every year, ANZAC Day reminds us that we always have something to be thankful for. The comfort of our homes, The safety of our countries, The love of our friends and family. These are just some of the things we get to enjoy and should appreciate every day – especially on 25 April. Born in the trenches of World War I, 2UP is a game brought back by our soldiers and carried on by us. Having been passed down from generation to generation, the 2UP custom now holds an important place in the hearts of many. 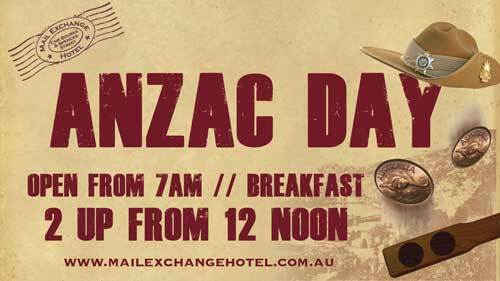 At the Mail Exchange Hotel, we’re proud to commemorate our ANZAC’s. That’s why on Wednesday 25 April, we’re inviting you to join us as we pay tribute to our Diggers – and their legacy. If you’re a dawn service attendee, or simply looking to mark this important day, our doors are open. Bright and early at 7am, we start the day right with a hearty breakfast, then at 12pm, get ready to head ‘em up! as we gather the crowd and kick off 2UP. Interested? Then book your place today, play a game (or two) – and let’s share in the tradition of our soldiers.